Add some art to your table with these quality tablemats and coasters. 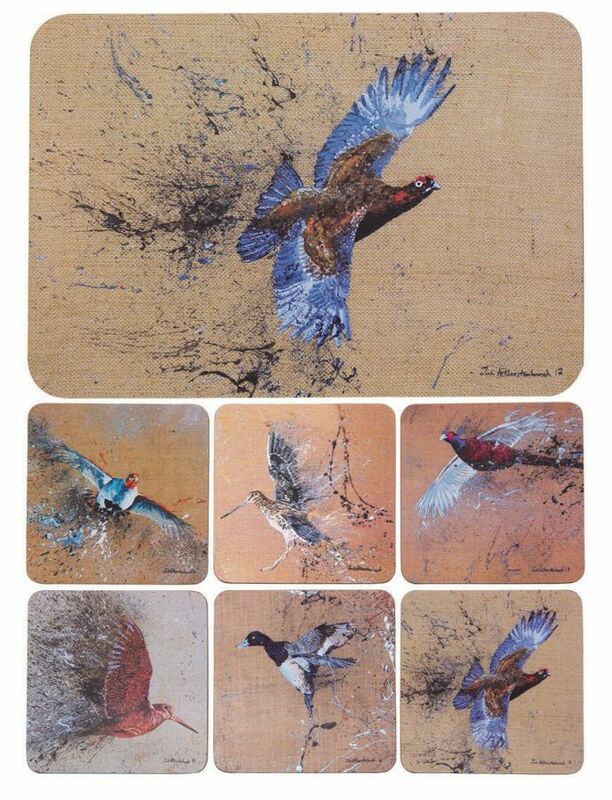 The stunning designs by Jack Fetherstonehaugh show some of Britain’s wild game birds including pheasant, red grouse, snipe and partridge. The mats are tough and durable, withstanding heat up to 90 degrees Celsius. They have a cork back and are easy to wipe clean. You can also just get the set of six coasters for £14.50 and table mats for £28.50 and we have several coasters on our online shop in various designs and prices. 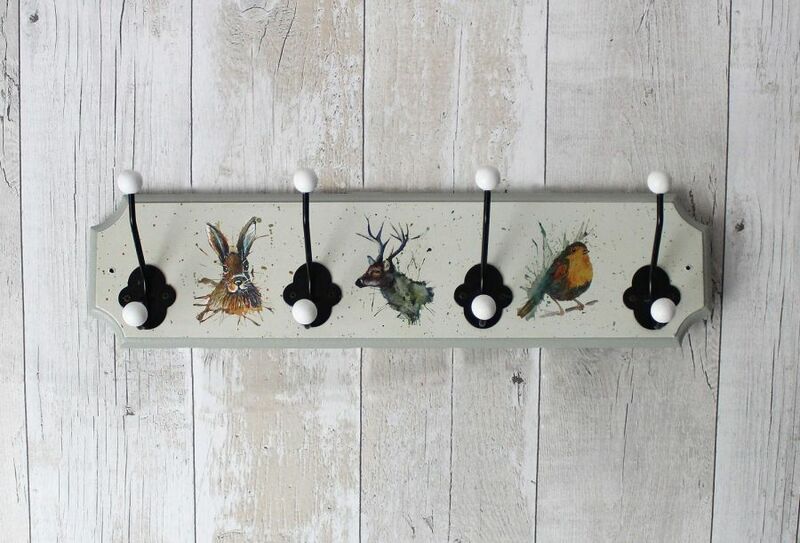 Bring some country animals inside with this four hook coat rack. The stunning animals featured are a hare, stag and robin, and are sure to catch your eye and any visitors when entering your home. The pale background colour of the hook rack means it will match to any colour scheme in your house. This mini decanter with pewter banding on the base and solid pewter shotgun and cartridge on the decanter makes for the perfect gift for someone who loves a drink and shooting. Accompanied by two elegant shot glasses measuring 6.6cm in height, the decanter is 14cm tall and a great addition to any drinks cabinet. The stylish modern design is handmade in the UK and delivered with a lined presentation box. 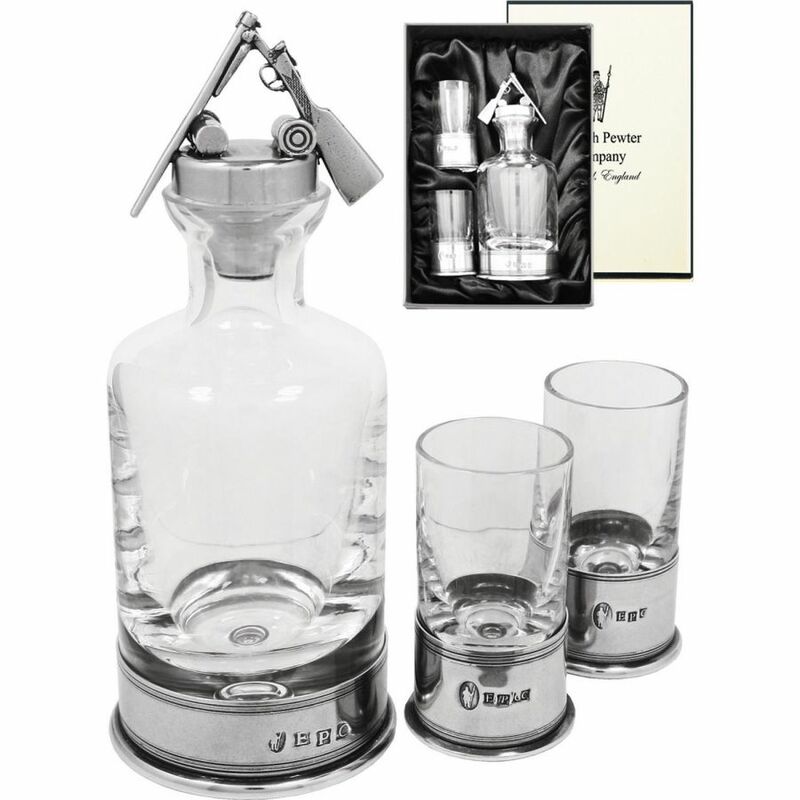 We also have a mini decanter set with a horse head design, also for £110.00. At Fur Feather & Fin we have lots of fantastic cushions to choose from with country themes such as rabbits in a meadow, pheasants in ferns, waddling ducks and elegant feather designs. 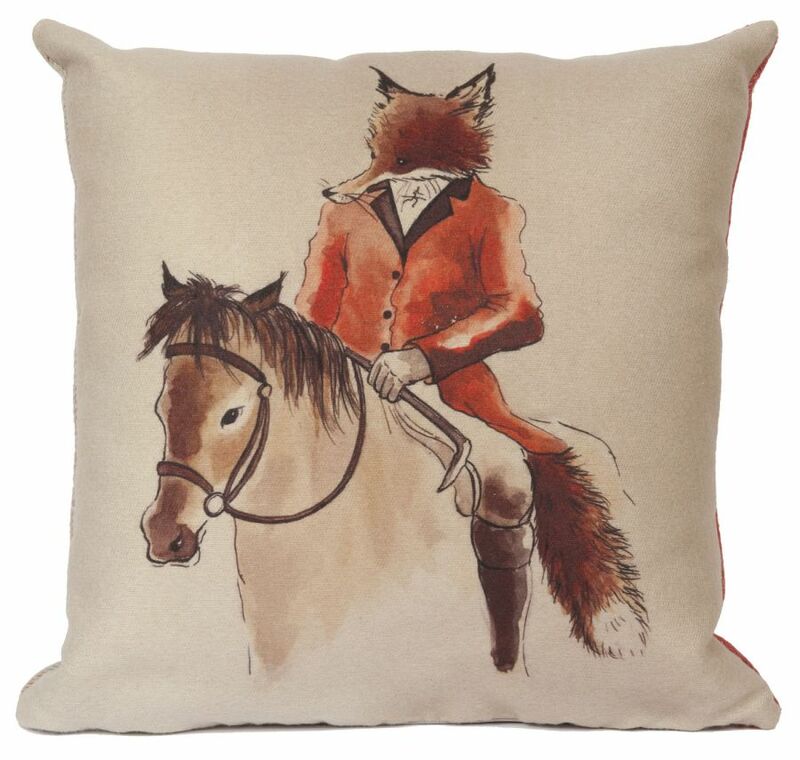 But new in is Mr Fox, dressed for hunting and sitting on a horse! The tweed tartan style backing is just as eye-catching as the front design and the cover is zipped for easy removal of the polycotton cushion. 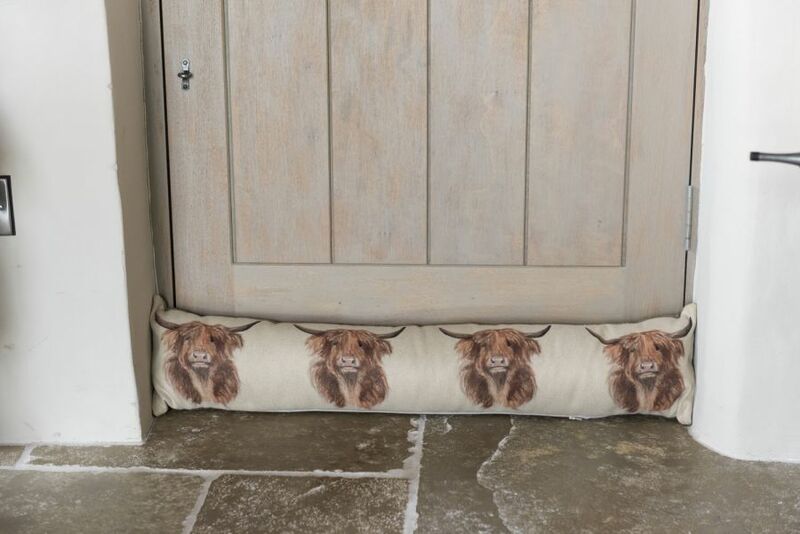 Make sure you are keeping warm in your country home with this luxurious, reversible and thick draught excluder with a Country Highland Cow design on the front and highland tartan check plaid on the reverse. Made of 100% polyester, it is dry clean only. If the highland cow design is not to the taste of the giftee, choose from a pheasant, stag head, hare, collie, spaniel, Jack Russell, border terrier or black Labrador design, all at £26.00. At Fur Feather & Fin, we have a selection of Wrendale design products which make ideal gifts for a country home. 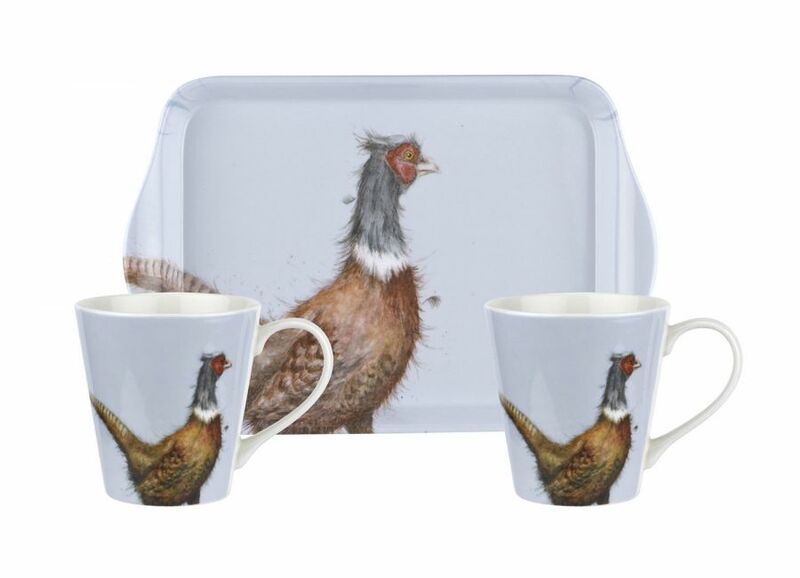 This mug and tray gift set has two porcelain mugs perfectly sized for coffee machines and a melamine tray for biscuits and snacks, all featuring a gorgeous pheasant design. Both tray and mugs are dishwasher safe. Other Wrendale gift sets with additional designs are also available. The Gluggle Jug makes a ‘gluggle’ sound when you pour, as air gets trapped in the tail. 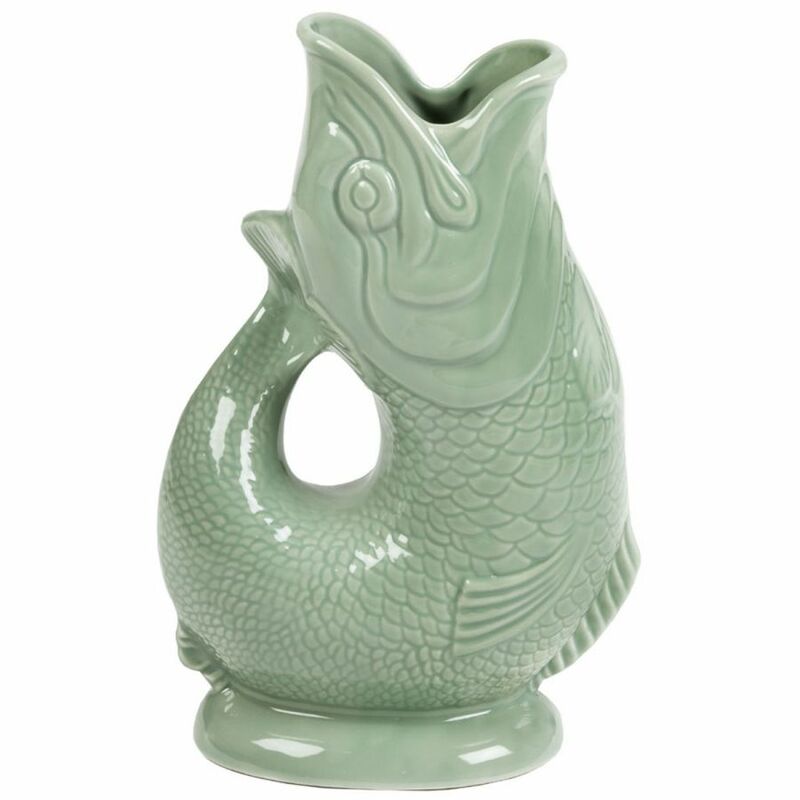 An ideal gift for family and friends – especially those who love to fish – the jug is sure to be a talking point when drinks are being poured out. The colours available are sage green, cobalt blue and white. 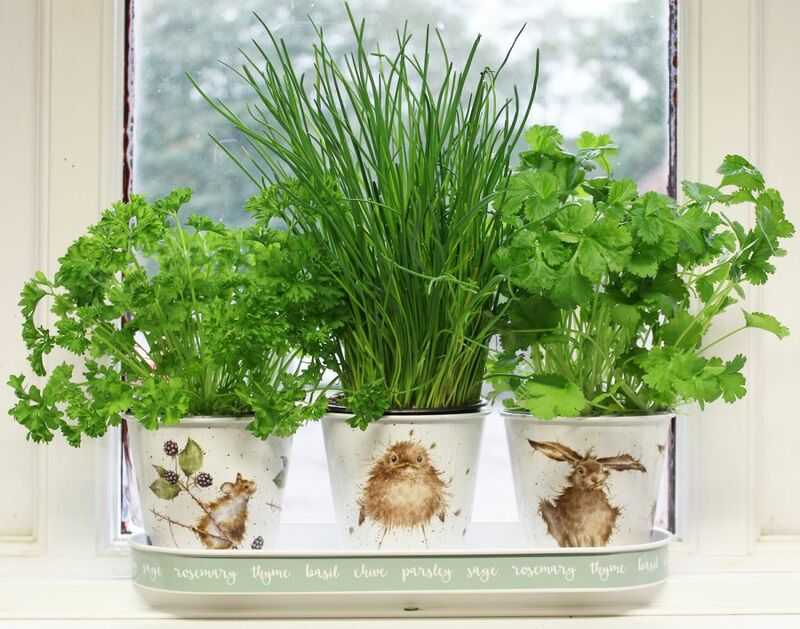 A perfect gift for someone who loves gardening and growing their own produce, these adorable little plant pots made from durable carbon steel are perfect for displaying on your window sill as the herbs grow. The animal designs on the pots include a mouse, hare and baby robin. 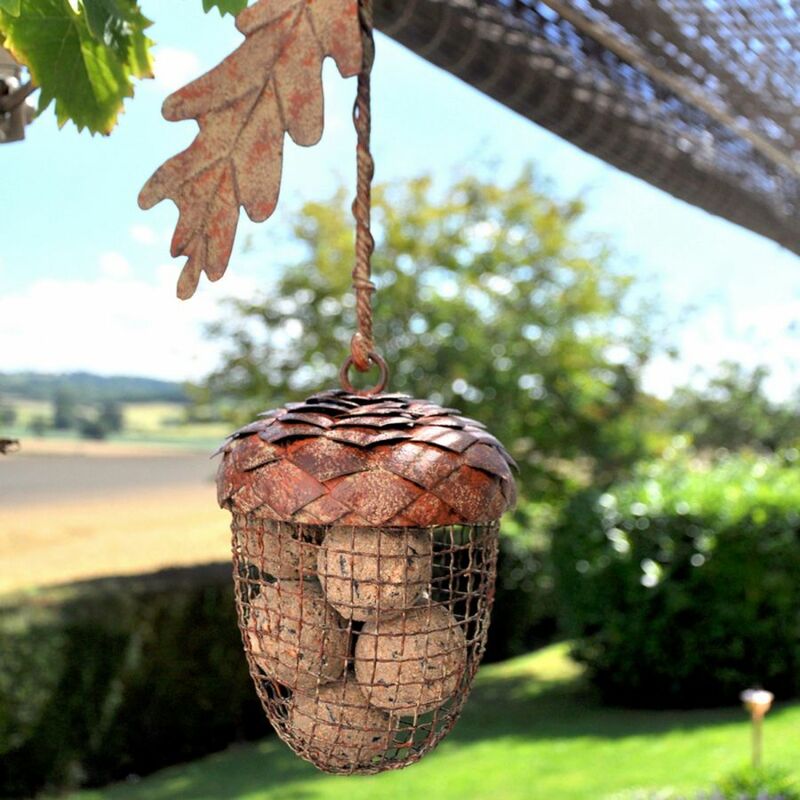 A fantastic addition to any garden, this ball feeder is in the eye-catching design of an acorn, and made to last. It can easily be attached to tree branches, stands or poles and can be refilled easily with fat balls. When the feeder is in place, the garden it’s in is sure to attract all sorts of garden birds such as sparrows, blackbirds, robins, thrushes, wagtails and more – so placing it in clear view of a window is a good idea too! 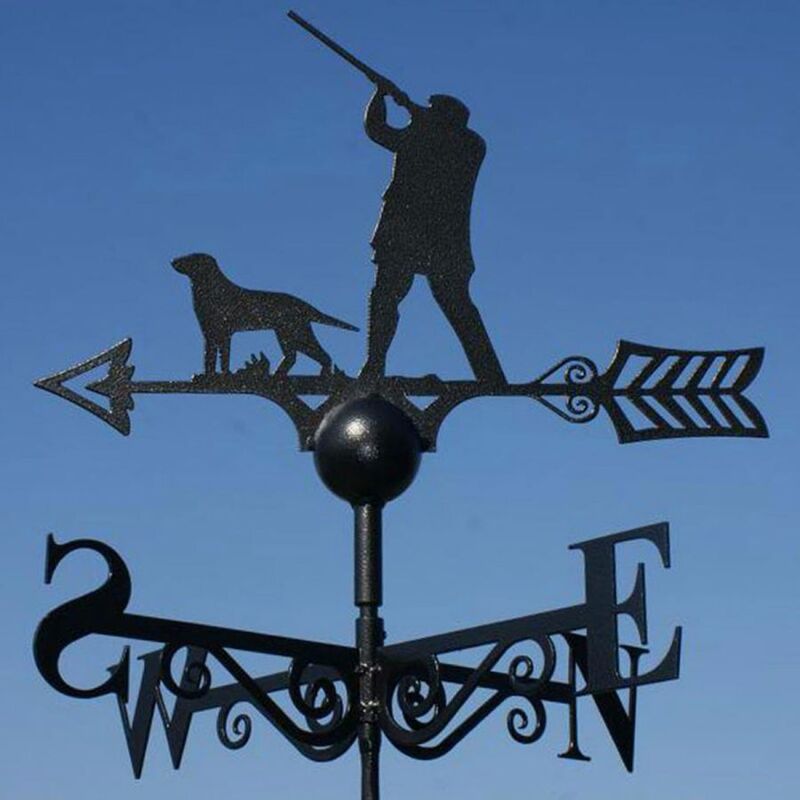 This traditional style weathervane is topped with a shooting scene, making it a great gift for someone who loves to shoot. British made, the weathervane is made from solid steel and coated in a black finish. It can be vertically mounted and the directional arms it makes it the perfect feature to any building no matter the size. There are several designs available, priced at £65.00 or £78.00 including a classic cockerel, golfer, horse and jockey, pig and dog. Please note delivery is 7-10 days. Hopefully this guide has given you some ideas for Christmas gifts to get family and friends who love country designs, animals and shooting. Be sure to browse our online shop for some Christmas treats for yourself too!